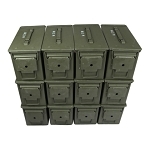 Get the cleanest, highest quality, surplus 30 cal M19A1 and 50 cal size M2A1 and M2A2 5.56 ammo cans for much less than retail! Mismatched lids, dents, rust, and spray painted cans are a thing of the past. 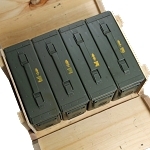 Our "once-opened" ammo cans are procured from private partners within the defense industry after the original ammunition is removed - not from a government auction. 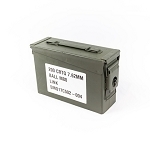 You will receive new condition, unissued, grade 1 quality, USA Made, Lake City ammo cans. 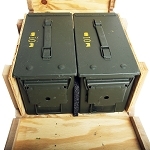 In addition, cleanammocans.com is the only online source for ammo boxes sold in authentic, military specification, wire-bound, wood ammo crates. Of course, the ammunition crates do more than just look cool, they are engineered to be a value added component of the military’s ammunition packaging system, and are vital to meeting the military’s 10-year un-sheltered ammunition storage requirement. You have come to the right place if you like the idea of high quality, like new, made in the USA ammo cans at prices lower than retail. Find out what our repeat customers already know. Order today! Why Store Ammo Cans in an Ammunition Crate? First, they look downright cool, you can stack them high and they are a great complement to any ammo stockpile or gun collection. 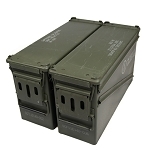 Second, they are a great way to organize, transport, and easily stack multiple ammo cans. Third, when individual ammunition cans are stacked on top of one another, the rubber seal in the lid of the ammo can bears the weight of all items stacked upon it, causing the seal to distort and fail over time. When the seal fails, the waterproof nature of the ammo container is compromised, exposing the contents of the ammo box to environmental conditions and moisture. 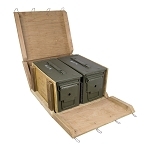 The military specification, wire-bound, ammunition crate is designed to bear the weight of the objects stacked on top of it, maintaining the integrity of the seals on the ammo cans inside the crate for long-term, waterproof storage. 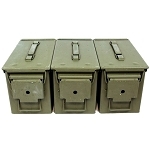 Ammo can crates are a perfect complement to any long-term ammo storage operation, they make great conversation pieces, and are an easy way to dress up any gun collection, but most importantly, they allow you to stack objects on top of your ammo cans without compromising the integrity of the waterproof rubber ammo can seals.